Yesterday, I was in an exchange addressing the use of a personal Facebook post in an article after it was removed. The implications of the discourse weighed heavy on me all day, through last night and into this morning. Like my tweets yesterday, anything we write is out there forever. I believe in the Afterlife, so I know I will be accountable for my words and how I exercised my privilege or ignored harm. A lower motivation is, whatever we write, no matter how embarrassing can resurface. Everything is saved on the internet and can still be harmful to others. If members of the target population express that something is xenophobic or racist, then it is. I was not empathetic to the feelings of Muslims whose grandparents, parents, or even themselves have immigrated to the U.S. We measure impact not intent. An immediate apology is warranted. I am sorry. With the ICE deportations going on right now and legislation being passed, it is important to be sensitive to the plight of undocumented, refugees, and immigrants. Being a person whose ancestors were forcibly migrated and whose bodies and blood are in the bricks of the foundations of many of the institutions, I feel a profound sense of belonging. It also puts me in a position of privilege as a non-immigrant. With that privilege comes a lack of empathy, which I demonstrated yesterday. I was busy explaining intent of converts like myself, as well as defend ideas that have been proposed in Sherman Jackson’s Islam and the blackamerican. For many Black American Muslims, the book helped explain a toxic dynamic in Muslim American communities where many of us lost our way. This dynamic was in accepting Arab and South Asian hegemonies (for example Tablighi jumu’ah or Saudi influenced Salafi Islam) that were detrimental to our psychological, material, and spiritual well being as individuals or the Black Muslim community as a whole. That framework does not take into account African/Black American relations, Latino Muslims, or refugees. Many people whose families immigrated from Muslim majority countries have expressed how alienated they feel with the immigrant/indigenous binary. I believe we must reject a hierarchy of who is more Muslim or who is more American. I think it is important to find language that is sensitive to all the parties involved to discuss power dynamics in Muslim communities and the politics of representation. I will do better in the future to avoid nativist or xenophobic language in my writing. I will also work more to address it where I find it. I started anti-racism work with much to learn and I am still learning. I know I will fall short in the future, and whether I am reminded harshly or gently, I hope I respond better in the future. I will work tirelessly to keep willing parties in the room to learn and grow together. Growth and transformation in myself and others inspire me. For those who have been harmed by my words yesterday or in the past, I hope that you accept this apology. Let me know going forward how we can begin to have meaningful discussions in building a community that best exemplifies that ideals we all share. Documentary Teaser for Prison Blues by Mustafa Davis. On July 17, 2014, Eric Garner, an African-American father of six, was killed by a police chokehold and nearly a year later, New York City settled a lawsuit by his family for $5.9 million. Over the past year, protests erupted in Ferguson, Missouri; New York,Baltimore,Los Angeles, and numerous other cities where black people have been brutalized by police. 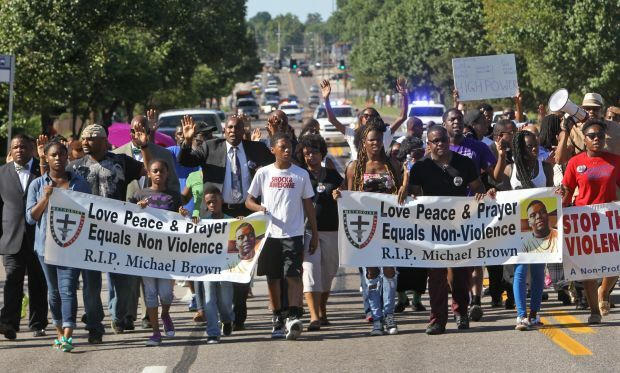 Live tweets, live streams and pictures highlighted the militarization of law enforcement. The outrage against police brutality has galvanized activists, community leaders and concerned citizens across the country, and has spurred Muslim coalitions such as Muslims for Ferguson and Muslims Make It Plain. Activists Carmen Perez, Linda Sarsour, and Tamika Mallory, along with 100 protesters completed a nine-day #March2Justice from New York to Washington, D.C., in April to highlight the problem of police oppression. But their long journey reflects the difficult challenge that we, as Americans in general and as Muslims in particular, have in addressing the real problems of policing in this country. If the Muslim community is going to truly deal with policing, then we must address the criminal justice system as a whole. We must delve deep into the issue and make abuse and oppression in our criminal justice system our issue. We must allow our faith to inform us into peaceful action by engaging with others and calling for action and reform where it is needed. In one off-the-record meeting at a Muslim community center with the FBI, a non-black Muslim community leader compared law enforcement with Muslims, saying that both are stereotyped because of the actions of a few. Many Muslim national organizations and advocacy groups have issued statements in support of #BlackLivesMatter protesters. When the Islamic Society of North America issued a statement about the escalation of violence during the Baltimore uprising, activists and organizations pointed out that ISNA’s focusing on the destruction of property downplayed the role of systemic racism in the criminal justice system. The controversy over ISNA’s statement about Baltimore demonstrates how social media has helped to shape conversations about police brutality and the justice system. Muslim media platforms and national organizations are beginning to engage when previously, only a few urban-based organizations, such as the Muslim Alliance of North America and Inner City Muslim Action Network, addressed the justice system and programs for the formerly incarcerated. But times are changing. For example, the 15-year-old murder conviction of Adnan Syed, which was detailed in a podcast “Serial,” has sparked the imagination of people across the country, as well as South Asian and Arab Muslims. These same Muslims raised over $100,000 to support his appeal. Syed’s narrative of being a child of immigrants, a model minority youth wrongfully convicted with thin evidence because of Islamophobia continues to captivate the country. Many people, who follow this story often fail to link Syed’s fate with that of many Latino and black people, who have also been wrongfully convicted. The Innocence Project has exonerated numerous men, who served decades in prison, and some of them only getting their names cleared long after their executions. Yet, some people still believe that justice is blind and support a kind of Muslim exceptionalism when it comes to how members of the Muslim community are treated by the criminal justice system. In contrast, when a black Muslim is accused of a crime, many Muslims will distance themselves from the case. For black Muslims, systemic racism and Islamophobia intersect in the most powerful ways in state surveillance, law enforcement and the criminal justice system. Some recent cases highlight this reality, such as the killing of Imam Luqman Abdullah, who was shot 20 times by federal agents during a raid at a warehouse in 2009; the case of Usaamah Rahim, who was killed by police while waiting at a bus stop in June; the case of Marcus Dwayne Robertson, who was arrested and jailed on tax fraud and illegal gun possession and about to be accused of terrorism based on his e-book collection but eventually set free for time served for previous charges. These men were all black and Muslim. Yet most Muslim leaders and organizations didn’t give these cases the full court attention afforded to non-black Muslims affected by law enforcement or the prison system. This implicitly extends such mainstream racism well into the Muslim community. The same implicit bias that causes officers to be more likely to shoot an unarmed black person than a white person also leads to racial disparities in the viewing, prosecution and sentencing of cases. Studies have shown that race also factors into the severity of the punishment, and even skin color and phenotype play a factor, considering that dark-skinned people receive longer and harsher sentences. Such a stark reality is also underscored by the fact that Dylann Roof, a white man who murdered nine African-Americans attending church in Charleston, South Carolina, was later apprehended alive and then taken to Burger King; while African-American Usaamah Rahim was shot to death at a bus stop without having committed any crime. Moving beyond the headlines and the latest hot spots, the Muslim community must address police misconduct as part of a larger broken system. This entails addressing policies and practices. In the book, The New Jim Crow, Michelle Alexander demonstrates how communities of color are disproportionately affected by mass incarceration, and activists such as Mariame Kaba have worked tirelessly to raise awareness about racial injustice in the criminal justice system. The prison industrial complex (PIC) is a term used to describe the overlapping interests of government and industry to use surveillance, policing and imprisonment as solutions to economic, social and political problems. Prison abolition activists argue that the PIC perpetuates the flawed belief that imprisonment is the solution to social problems such as substance abuse, homelessness, illiteracy and mental illness. Further, the “school-to-prison pipeline” refers to the policies and practices that push low-income children out of classrooms and into the juvenile and criminal justice systems. Schools are more likely to punish young black boys and girls more severely, charging them with crimes and sending them into the juvenile court system than their white counterparts for the same offenses. Our society is more apt to invest in prisons rather than education or preventative measures, such as substance abuse or rehabilitation programs. For more than 20 years, I have heard Muslims cite the Hadith, “Feed the hungry, visit the sick and set free the captives.” (Sahih Al-Bukhari, Volume 7, Hadith 552) America’s incarcerated community is held captive, and former offenders often suffer from a lifetime of stigma and discrimination. Our communities, however, are often hands-off when it comes to prison populations. They limit support to distributing prison daw’ah (proselytizing) while leaving rehabilitation and reentry programs cash strapped. The Muslim community, as a whole, has done little to advocate for progressive reform of the criminal justice system. There are exceptions. We can look to local efforts as models and amplify their work. For example, the Latino Muslim Association of America (LALMA) and Islah LA worked with faith-based community organizers, LA Voice, to help pass Proposition 47, which reduced nonviolent felonies to misdemeanors in California. Our national Muslim advocacy organizations and lay people across the country should support current criminal justice reform efforts. One place to start is by supporting the Ban the Box campaign, which seeks fair employment for people with past convictions. As individuals, we can donate our time or resources to help build capacity for organizations working on police brutality and the criminal justice system by taking part in faith-based organizing, joining multiethnic coalitions or supporting organizations doing grassroots work. Muslim Americans, as a community, cannot allow for injustice to fester in our justice system and expect to receive justice for ourselves. Whether calling for criminal justice reform, supporting prisoners’ rights or advocating for changes in policing, our faith must inform our actions. Read the original published at Islamic Monthly. On February 5th, Muslim twitter responded to the Right Wing backlash over Obama meeting with Muslims leaders with hilarious tweets #MuslimMeeting. Although many of the tweets were light hearted, others were critical of the meeting largely due to its secrecy. “We want to know who attended the meeting?” While Dean Obeidallah released his statement right away, organizations such as American Muslim Health Professions, Muslim Advocates, and Muslim Public Affairs Council released separate statements. The White House issued a statement saying that “Among the topics of discussion were the community’s efforts and partnerships with the Administration on a range of domestic issues such as the Affordable Care Act, issues of anti-Muslim violence and discrimination, the 21st Century Policing Task Force, and the upcoming White House Summit on Countering Violence (sic) Extremism.” Despite the controversy on social media, numerous people noted the unprecedented gender and ethnic diversity of the meeting once all the attendees were identified. And within that diversity, African-American or Black Muslims addressed their community’s concerns in a space where they had historically been excluded. While diversity is often dismissed as a politically correct catchword, the lack of diversity in representation and opinion within the Muslim community when it comes to representing our collective concerns to administrative bodies has had a troubling effect on Black and Latino communities. A salient example of this is the pervasive CVE programming that has been created by Muslim organizations.This programming has ignored the complex and difficult history that Black and Latino communities have had faced with law enforcement and created a new set of mechanisms to criminalize and marginalize these communities. We come with more skeptical born of historical reality. We come to these programs, asking how do these programs do damage to our community. There are people who are watching and reporting back to the government, we are very ambivalent about the stated goals of these types of programs. As Rashad points out that organizations aligning with CVE might not “recognize how programs just like this have been used to undermine self determination and self identity of a community.” This has led to ambivalent feelings about the government and law enforcement agencies. Elijah Muhammad and Malcolm X’s FBI files provide some insight into the extent of surveillance. It should be remembered that Malcolm X did not grow up in a vacuum, as his father who was a follower of Marcus Garvey met an untimely death and the US government worked to undermine Black self determination, from the time of Marcus Garvey to the Black Panther Party. Thus, these suspicions are not unwarranted. Black American Muslims have good reasons for looking at CVE programs not as partnerships between government and Muslim communities, but mechanisms of control. Yet, violent extremism seems to be the only platform that some Muslim groups are gaining traction in DC. This is causing further fragmentation within the American Muslim community along racial lines. Muslims and non-Muslim activists and civil liberties groups are concerned about the security framework for Muslim engagement with the government. Local and Federal law enforcement agencies often do not approach the Muslim American community outside of issues of national security or foreign policy. In essence, Muslims are criminalized and deemed foreign. Such approach also marginalizes the Black Muslim community and creates a dichotomy, which was applied during the colonial period: the good Muslim versus the Bad Muslim. From a civil liberties perspective, Counter Violent Extremism programs and the Security framework is deeply troubling. The unease is especially tangible as Muslim Americans are still waiting for the decision of the appeals case is considering constitutionality of NYPD’s spying program, which targeted Muslim Americans simply for their religion. Although LAPD did not take the same measures as the NYPD in spying, the Suspicious Activities Reporting (SAR) program has raised similar concerns amongst civil liberties groups,such as the ACLU. Based on the type of activities falling under Suspcious Activity Reporting (SAR) individuals doing simple things such as taking pictures or asking directions can come find themselves under state surveillance. According to the LA Times, the Obama administration has chosen LA as one of the pilot programs for CVE. I spoke with Garrison Doreck, a PhD student at Irvine who has worked on Muslim Rights, Mapping programs, and civic engagement. He attended a series of law enforcement outreach meetings as a participant observer. He explained that they were a series of public forums where the LAPD goes to different mosques to address various issues or themes. These meetings are powerful junctures where the community can voice their concerns, all the while feeling the watchful eye of the government. In October 2014, Sahar Aziz argued that these meetings could be intelligence gathering opportunities. While Aziz pointed to the profiling of Arabs and South Asians, increasingly Black American Muslims are under suspicion. Doreck pointed to the Suspicious Activity Reports (SAR) audits, highlighting some of the racial disparities. Although Muslim groups in Los Angeles have pushed for more reform, the suspicions have shifted away from immigrant Muslims and increasingly towards Black Muslims, who are now disproportionately the subject of Suspicious Activity Reports. This points to Several prominent Black Muslim community leaders, have called for Muslim advocacy groups in DC to be more representative of the diverse Muslim American population. So when MPAC gave Michael Downing an award, it reflected that disconnect with the Black and Latino community who were still reeling from police killing of Ezzel Ford. The petition that ciruclated before the event prompted MPAC to create hold a “Let’s Be Honest”panel at the MPAC 2014 conference moderated by Jihad Turk, and featuring Jihad Saafir, Hind Makki, Marwa Aly, Rami Nashashibi, and Khalid Latif. Many, have pointed to MPAC’s tone deaf choice for MPAC to name its CVE “Safe Spaces.” Safe space is a term where a marginalized group does not “face standard mainstream stereotypes and marginalization” or people with shared political and ideological stances can express themselves openly. By being asked to report “Suspicious Activities,” this means that Muslims are supposed to internalize the CVE and report on each other. I was just dealing with CAIR, they came to ACLU and 10 organizations including members of Black Lives Matter who were interested in dealing with definition of racial profiling trying to get LAPD to have a definition aligned with DOJ on their definition. We are working on drafting a bill with Senator Weber. Hakim, Allgood and Rashad point to the need to address the conditions that cause the radicalization or destructive patterns in multiple groups. While people have looked to Islam as the problem or Black and Latinos as a problem, the very same conditions cause disaffected white men to join hate groups or become involved in drugs and gangs as well. Kameelah Mu’min Rashad hoped that Muslim national organizations followed Black American Muslim approaches to civic engagement and social justice work. She explained “The government engagement, civic work, and community involvement is different, the reach of Black Muslims usually extends to the community regardless of faith,” Umar Hakim affirmed this sentiment, pointing out that he is not just concerned about social justice as it relates to Muslims, but to the broader society. In other words, Muslim social justice issues should broaden to not just focus on Muslim specific issues, but issues that improve the overall conditions in society. The most important lesson learned from the Muslim meeting is that the Black American participants pointed to ways in which the government can engage with Muslims as partners in addressing social justice issues. Focusing on local efforts, Muslims have the most potential for change. Also centering Black/African American Muslims in this conversation is also critical to achieving a shift in civic engagement. One such issue is racial profiling, police brutality, and the Prison Industrial Complex. Muslim Americans must come together and take a stand, make a statement about 21st century policing in support of #BlackLivesMatter. We need our Muslim stakeholders, including imams, grassroots organizers, concerned citizens, community leaders, and civil service workers, to come together, create a roadmap, build coalitions and engage in a meaningful way. As national organizations such as CAIR and Muslim Advocates become more aligned with grassroots work against racial and religious profiling, they can become more inclusive, effective, and responsive to our community’s needs. http://www.isna.net/isna-president-at-the-white-house.html ISNA writes that the members who attended inclued: Dr. Sherman Jackson, the King Faisal Chair of Islamic Thought and Culture and Professor of Religion and American Studies and Ethnicity at the University of Southern California (USC), Farhana Khera, president and executive director of Muslim Advocates, Imam Mohamed Magid from All Dulles Area Muslim Society (ADAMS) and former president of ISNA, Arshia Wajid, founder and president of American Muslim Health Professionals (AMHP), Hoda Elshishtawy, the national policy analyst for the Muslim Public Affairs Council (MPAC), Farhan Latif, chief operating officer and director of policy impact with the Institute for Social Policy and Understanding (ISPU), Maya Berry, executive director of the Arab-American Institute (AAI), Palestinian-American comedian Dean Obeidallah, Rahat Hussain, director of legal and policy Affairs with Universal Muslim Association of America (UMAA), Diego Arancibia, Board Member and Associate Director of Ta’Leef Collective, Kameelah Mu’Min Rashad, Muslim Chaplain at the University of Pennsylvania and Founder of the Muslim Wellness Foundation,and Bilqis Abdul-Qaadir, a graduate assistant with Indiana State University’s women’s basketball team who played basketball while wearing the Islamic headscarf.? Mass incarceration, police brutality and the frequency of extrajudicial killings of Black Americans in the United States , including that of Imam Luqman Ameen Abdullah and Amadou Diallo (One every 28 hours) are reflections of the structural racism in our society. The activation of the National Guard in Missouri this week is a stark reminder of the militarized response to non-violent protests. Donna Auston gave me a powerful reminder that we as Muslims should not only care because some of the victims are Muslims. We should care period. Also, we must be vigilant about not making this an issue a Black male problem, the police brutality, sexual exploration, and extra-judicial executions of Black women like Women like Elanor Bumpurs or Kathryn Johnston. Read the rest of the post on at reMARC. I’ve often said that the three largest challenges facing American Muslim communities are misogyny, racism and sectarianism, which is why I’m proud to be one of the founding members of Muslim ARC. Like Hind Makki, I’m so honored to work with Muslims of different ethnic and racial backgrounds, denominations, and orientations of faith came to address racism. This Black History Month, we hope to deepen our conversation with three more hashtags. 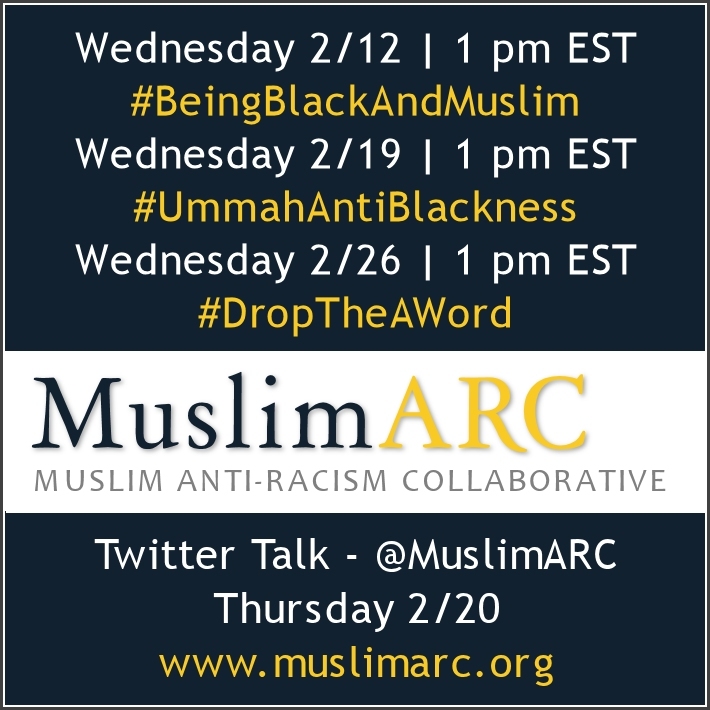 In addition, on Feb. 20 Twitter Talk with African American Muslim leaders, Dawud Walid, Amin Nathari, Amina Wadud, and Donna Auston. And reflecting our move from social networking activism to a grassroots movement, we are asking you to help us by appealing to our imams and khateebs to dedicate at least one khutbah (Friday Sermon) dedicated to intra-Muslim racism. MuslimARC is focusing our anti-racism khutbahs on Friday Feb. 21st, the anniversary of the iconic Black American Muslim leader Malcolm X. Please share our letter to imams with imams, khateeb and local communities. You can email the letter to your local community leader from the website or download a pdf here. Here is our letter below. Please share widely. We are contacting you on behalf of the Muslim Anti-Racism Collaborative (MuslimARC) with a khutbah request for Black History Month. From the time of our Noble Prophet ﷺ‎, anti-Black and anti-African racism has plagued Muslim societies and communities. As you are aware, these beliefs go against the messages that are at the heart of our Holy Qur’an and Prophetic traditions. —Prophet Muhammad ﷺ, The Last Sermon. One way that we can raise awareness regarding anti-Black racism today is by continuing to educate ourselves and others. If you have not already, would you please consider speaking about Black Muslim history and anti-Black racism in the ummah during your khutbah on Friday, February 21st? As an imam, you are a central figure in many Muslim communities and are thus specially positioned in your community to address these important topics and begin a conversation in your city about an issue that is often not thoroughly addressed. We ask that you take this opportunity to highlight our ethical responsibilities as Muslims to challenge ethnic chauvinism and tribalism. In the interest of strengthening our brotherhood, we are providing you with a list of topics that we think merit particular attention given what we have observed in our ongoing conversations on social media and with Muslim organizers and activists across the country. Lastly, we would like to note that February 21 is the day El-Hajj Malik El-Shabazz (Malcolm X) was assassinated in New York City, NY in 1965. As he noted in his Letter from Mecca after completing Hajj, “America needs to understand Islam, because this is the one religion that erases from its society the race problem.” His life left a profound mark on American society and continues to inspire Muslims around the world. Still today, nearly 50 years after his death, Muslims of all backgrounds note the role his words have had in calling them to Islam and/or strengthening their imaan. Thus, giving a “Black History Month Khutbah” is a beautiful way for Muslims nationwide to explore and discuss – together – the legacy of Africans and African American Muslims and their contributions to the ummah. We humbly request that you join us in this initiative so that we are better able to hold fast to the message of unity and brotherhood in Islam. Please do not hesitate to contact MuslimARC if you have any questions or to let us know that your congregation will be participating. We are also more than happy to provide you with resources for your khutbah. We encourage you to record your khutbah, if able, and to send a copy or link to the recording to info@muslimarc.org so that others may benefit from your words. MuslimARC is an organization working to find ways to creatively address and effectively challenge racism in Muslim communities. Online at http://www.muslimarc.org. Dawud Walid, “ Intra-Muslim Racism: Confronting Ethnic Slurs and Racism Among American Muslims” January 19, 2014 from http://www.altmuslimah.com/b/mca/4893/. 11 Facts About Racial Discrimination, http://www.dosomething.org/tipsandtools/11-facts-about-racial-discrimination. Rania Khalek, “Every 28 Hours an African American is Extrajudicially Executed in the U.S.” April 15, 2013 http://raniakhalek.com/2013/04/15/every-28-hours-an-african-american-is-extrajudicially-executed-in-the-u-s/. Dawud Walid, “Year Anniversary of Imam Luqman Shooting Today” October 28, 2010 from http://dawudwalid.wordpress.com/2010/10/28/year-anniversary-of-imam-luqman-shooting/. Malcolm X, “Letter from Mecca” April 1964 from http://www.malcolm-x.org/docs/let_mecca.htm.